The seventies were very empowering for women. From the swinging (and later hippie) vibes of the sixties, the seventies ushered in an era of pantsuits (read: power suits), pussybow blouses, platforms, Studio 54-esque sequinned numbers and lots of bell bottomed jeans. We were no longer just a bunch of women preaching 'free love'. Even the classic fashion icons of the '70s embodied that kind of a certain sturdiness of principles and ideas. It's never disappointing to see how fashion affects society at large at any given point of time. It is interesting to note that while the bell bottoms made an appearance in the '60s, their place in widely accepted fashion was only secured in the '70s. Doing street style circa '70s with a classic FTLOFAOT twist. Hope you like it. The next exciting thing on the horizon is The Amazon India Fashion Week presented by FDCI, of course. All you need to know about the biggest fashion extravaganza of the season can be found here and here. With Sanjay Garg of Raw Mango opening the week long fashion shindig and names like Maybelline India and Spaces Home and Beyond associated with AIFW this season, this is just going to be bigger and better than ever. More updates about AIFW on the blog and my twitter and instagram soon. "I need to drop a few sizes by December." "This isn't my size, I'm an Extra extra small." "Let's go shop in the side of the store that stocks bigger sizes." I've heard these comments far too often because as a part of our innate psychic, we tend to make all debates about weight, body shape, etc about the size. What we tend to forget is that size is only one aspect of it and the other happens to be your body shape. 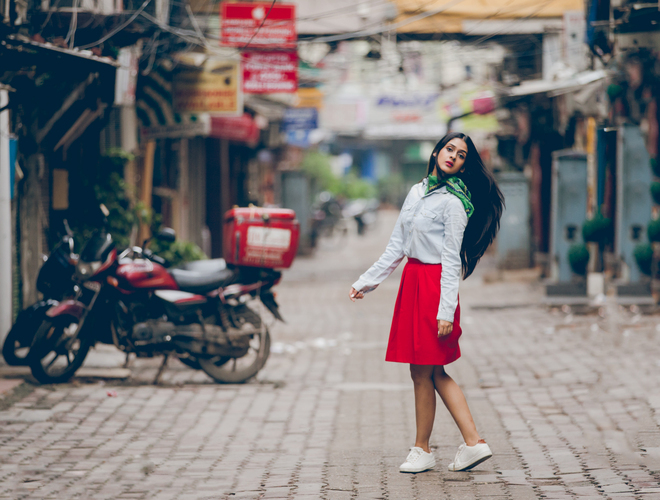 Most women in the Indian subcontinent want to shop for clothes based on the 'fit' of the clothing and what we don't realise is that a fit has as much to do with a body shape as it does with the size. For instance, I have a pear shaped body and I tend to gravitate towards clothes that accentuate my petite top and décolletage as opposed to emphasising on a larger bottom and thighs. Even when I wear pencil skirts, I tend to balance out the proportions by wearing something a little boxy or billowy at the top. As a fashion blogger, I feel a sense of responsibility to educate my readers about different things you can do to accentuate different body shapes. Because losing weight to get fitter and healthier is good but dropping sizes by starving yourself with an obscure dream of changing your body shape, is not. It's almost disheartening how we all dream of being a body shape that isn't ours. While you can drop a size or two, you cannot change your body shape and maybe it is time to celebrate that as we celebrate the myriad sizes that exist. 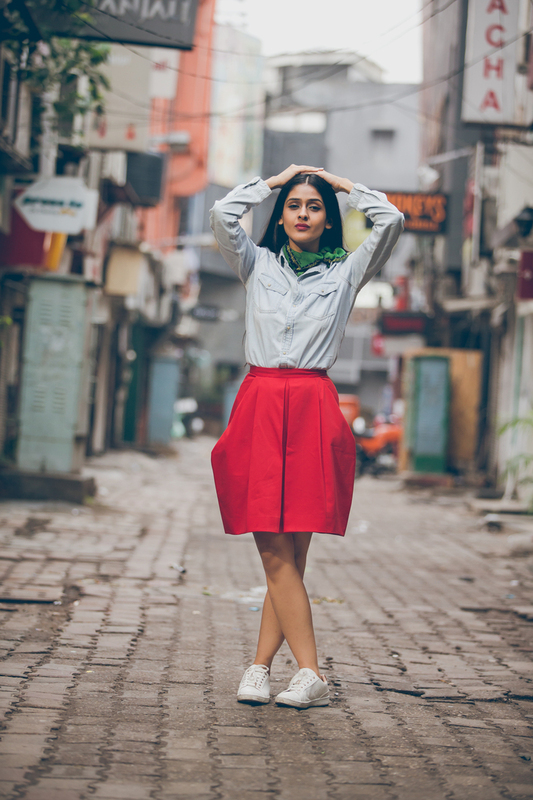 As a part of a really interesting initiative by myntra, women across the country can now shop according to their shapes, not just their sizes. They are ushering in this cool feature by the concept of Shape ID- the ratio of bust:waist:hips (4:2:4, 3:2:4, 4:4:3, 3:3:3) that mirrors the shapes Hourglass, Pear, Apple, Rectangle and spans across sizes. This not just helps you discover your body shape, it helps you browse through pieces that are most likely to flatter your body shape. I find this commendable on two levels: a) You are sending out a message to your shoppers (a lot of whom happen to be of an impressionable age) that you are celebrating all body shapes b) You are aiding a lot of shoppers who shy away from online shopping make more informed choices online. 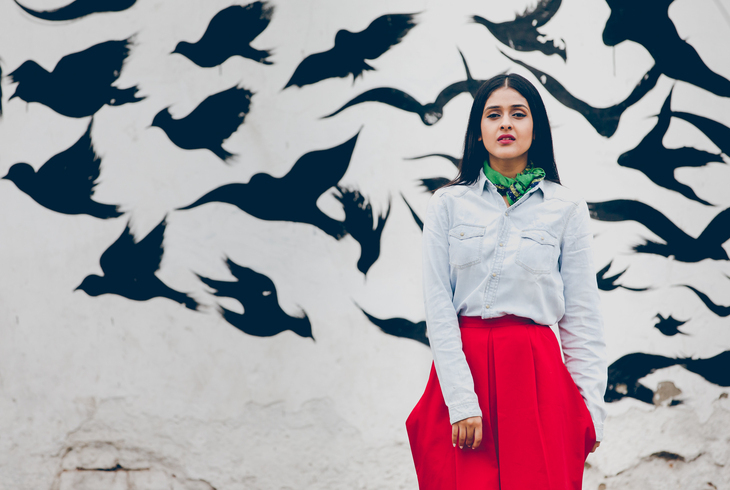 Take a cue from some of India's most popular bloggers as they work these outfits based on their very different body shapes. Nitika of The Shopaholic Diaries, Pallavi of ModaNinja, Shaily of Confessions of a Closet, Sonaksha of The Sonshu, Anshita of Vanity No Apologies. Get the Myntra app and try their shop by shape feature to experience the different recommendations made by them based on your body shape. 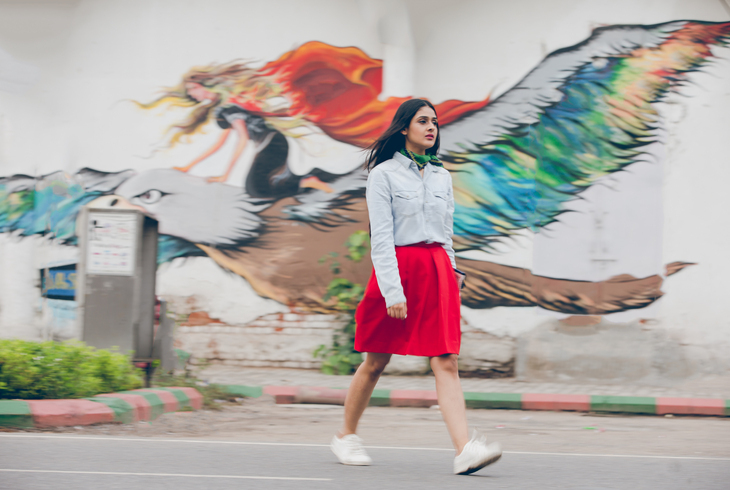 For example, for a body type like mine which is Shape ID 3:2:4 (pear-shaped), Myntra recommends you wear ruffled tops, puff sleeves, embellished necklines, double-breasted jackets, among others that accentuate your elegant shoulder-line and move attention to your upper-body. Leaving you with a penny for my thoughts. Think about the emphasis that is laid on celebrating and appreciating the different interests of every human being. We rejoice at the fact that not everyone aims to be a Doctor or an Engineer anymore and we are steering towards creating a place for every kind of passion and interest. If that was to apply to physical attributes, would it not be in place to make space for all shapes and not hold one higher up in the hierarchy? Maybe this initiative by Myntra is one step closer to ridding the society of this anathema? It all started with Virat Kohli and Wrogn flinging pearls of hangover wisdom at us on twitter which we lapped up, quite happily of course. But with not a clue of what was to follow. The next stage got real intense and was personally my favourite when Virat challenged the God of all things cricket, Sachin Tendulkar to a 'game' which he doubted he could handle. I'm certainly glad I got hooked at that point because it led me to this cool interactive game of WROGN auditions (with Virat sitting across me on the screen and conversing with me directly *gulp*) which could potentially *hold your breath* take me and three friends for a crazy Hangover-esue experience in Vegas. I'm not usually the one to fall bait to contests but this game essentially got me playing for a number of reasons. I love the graphics and sound effects of the game. I know as a non-gamer, I don't really carry a strong point of view about VFX but a game that gets you in the groove and wondering what Virat would throw next at you, is definitely high on the VFX quotient. It only helps that it feels like Virat is sitting across you and questioning you. The format of the game. There is really no right or wrong answer for most questions if you think about it but Virat makes cool use of logic to decide whether your answer is right or wrong. The questions asked. "Can you parallel park when you're drunk?" The answer seems fairly obvious depending on your capabilities but in the face of fire, it's hard to really remember that you are not supposed to be driving at all since you're drunk. 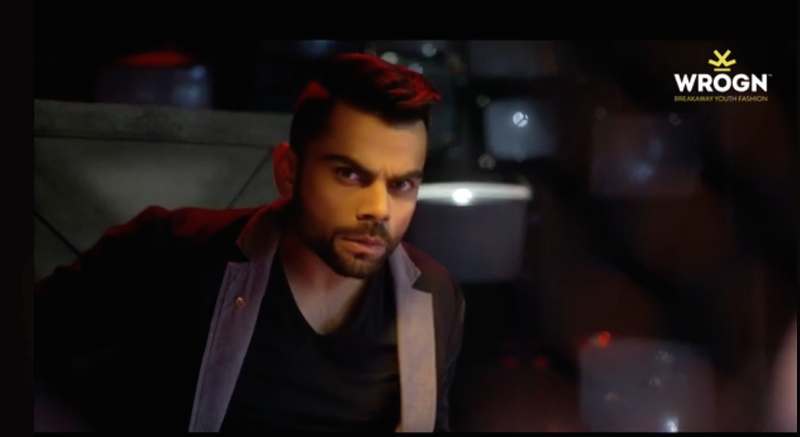 Another one of my favourites was the one where Virat asks if you had ever taken ten selfies in a day. Some days we are vainer than the rest of the days and ten almost seems a small number to weigh our vanity in terms of. But Virat's clear ideas of narcissism and how I should let other people take photos of me got me out of the game pretty early on. You could still be unsure about whether you want to spend a precious ten minutes attempting to play the game but then there is always a reminder: You could be in Vegas at Caesar's Palace reliving Hangover (sans a shirtless Bradley Cooper of course) if you win. Maybe, just maybe..you want to play? A label that can makes its mark and leave an imprint, from a sea of extremely talented Gen-Next designers is one to really put your money on. 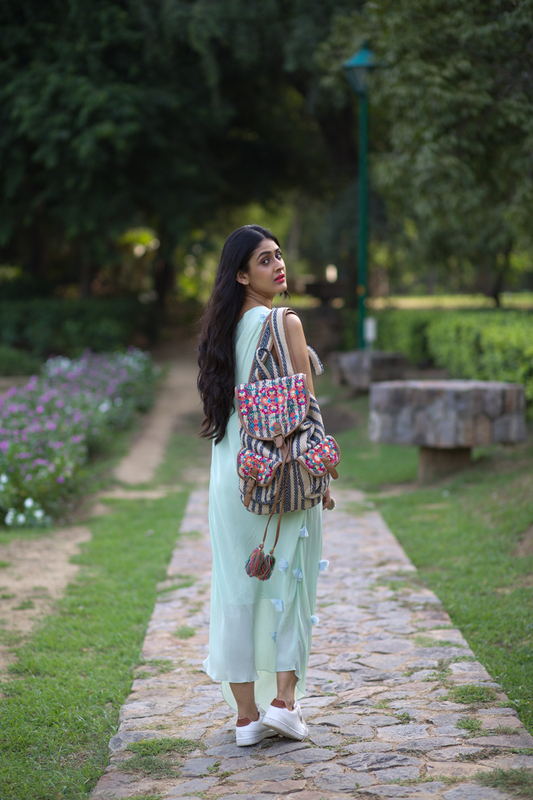 As a fashion blogger who saw Surbhi's debut show at Lakme Fashion Week, I instantly warmed up to her ideas of fashion. She created dramatic face masks to accompany her dark, bohemian collection which played around with easy fluid drapes and some interesting, feline silhouettes. It helped that her collection the next season took the bohemian girl to a summer soiree and gave it the Midas touch of fun summer dressing. 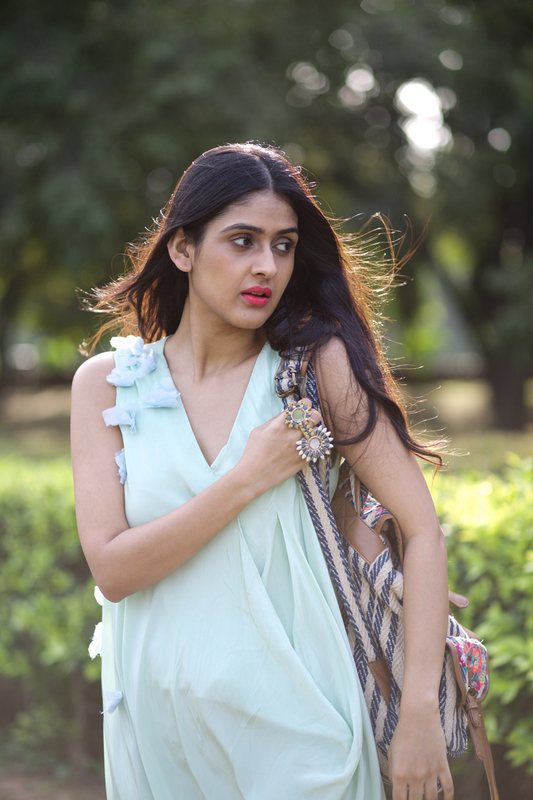 Surbhi Shekhar Label plays on its strengths of creating crisp modern separates and for someone like me who does not invest in one season wonders, her pieces lend a sense of utilitarianism to my wardrobe. It is a question a lot of designers should probably be answering too; whether their garments can stand the test of time. 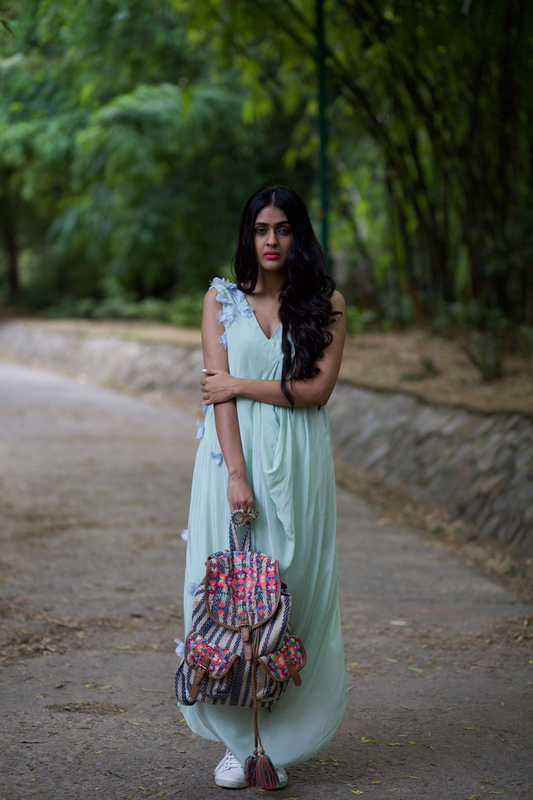 Since this garment by Surbhi was in these pretty tones of pastels, I decided to accentuate it with little bright pops. One in the form of the neon pink lips. The other in the form of the complementing neon threadwork on my backpack. 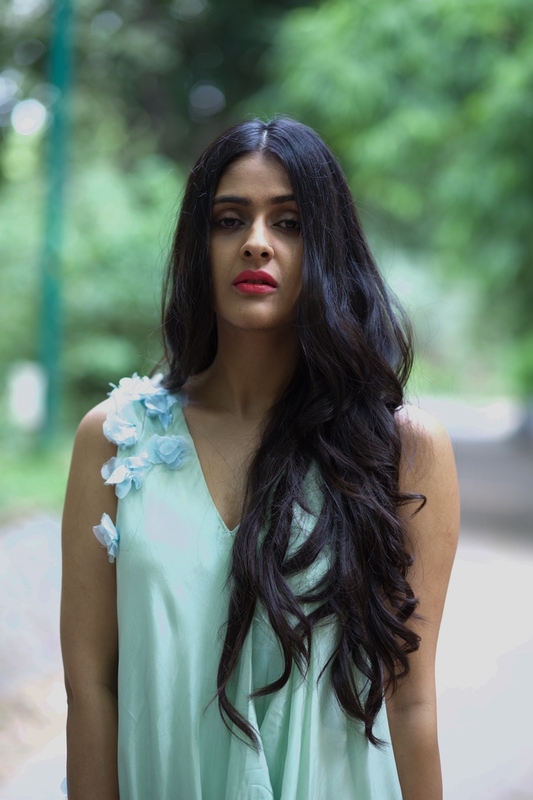 The balmy blue diaphanous flowers truly embody the theme of Surbhi's collection; 'Diphylleia grayi' the skeleton flower. I would not shy away from donning this particular piece for a sun-downer or even a party for two by the beach. For folks out there who enjoy a particular youthful yet versatile style of clothing, this is a label you need to keep your eyes peeled for. But every day we are lovers. For there is none, that a mind cannot love. Somedays there is no gloss. No lacquer. Just plain old opinions with a side of questions. Served piping hot. Because as soothsayers of the fashion industry, we are plagued with the disease to be opinionated. Not mere cheer leaders. And mind you, an opinion formed out of knowledge and information is the only one that counts. Maybe today would be the ideal day to talk about what in my definition, is fashion blogging, not necessarily opposed to status quo. For those of you not interested in this ever raging monstrosity of a debate, you are free to browse through the images alone. When I forayed into this now thickly populated jungle that is fashion blogging, almost six years back, my idea was this: I have a keen interest in fashion and I love writing and I'm going to put the two together and document interesting things that I have to say and shoot. I am happy to report that despite the dynamic nature of the internet and social media, I am till date, doing just that. Does that mean I have an opinion that will strike off a keen debate every time? Probably not but I do genuinely attempt to have an informed opinion about a variety of subjects under the vast realm of fashion that interest me. Does that mean that I'm an #ootd mannequin? Definitely not. I find myself in the zone where I feel the need to talk about my ideas of fashion and style in things and perspectives much larger than OOTDs. I talk about my travel, however limited. I talk about books. I talk about issues that pertain to womanhood and society. And yes, I also post about my looks and OOTDs. But where is the smart in the fashion blogger? 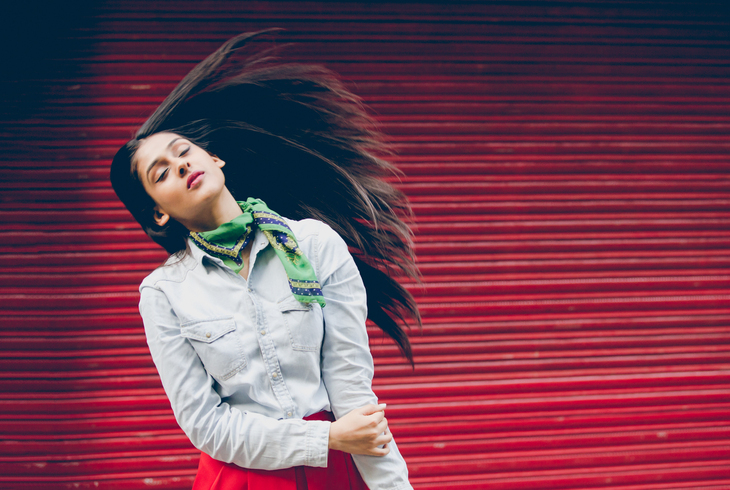 Where is the funny in the fashion blogger? Are we going to start addressing everyone as a fashion blogger merely by the virtue of their overuse of the word 'chic'? Is everyone who posts their daily outfits on instagram a fashion blogger? What about the crazy perpetually-pushing-the-envelope fashion blogger? Where do I find her/him? You know how a few grains of salt can make all the difference to an otherwise spectacular dish? 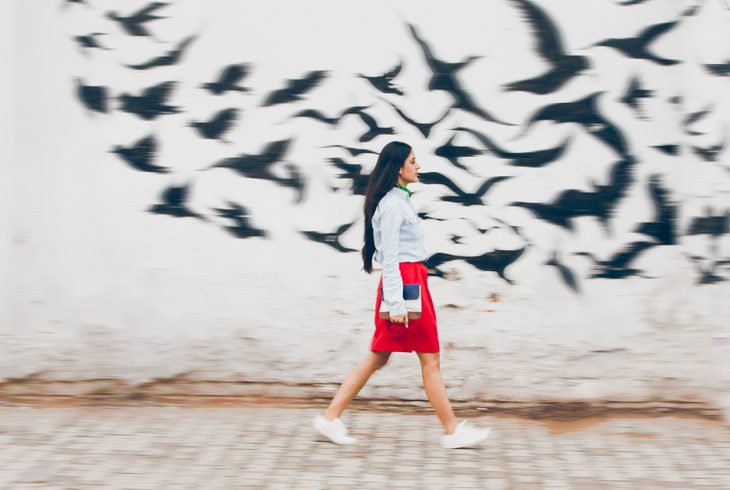 From the perspective of a reader (of all kinds of fashion blogs), it is all about retaining that distinct flavour. Finding that one spice and perfecting it. The aspiration is simple. To make people think. To maybe make a few smile. To inspire and create an aspirational value around whatever it is that you do best. To make a reader want to google a term by its smart, yet not overbearing use. To create a style statement (pardon the use of the cliche) that makes people want to pin you to their boards. (That came out much dirtier than expected) I simply mean be a pinterest sensation, maybe. Not because I am an armchair policy maker but because as someone who professes fashion blogging as a career now, I want to feel the surge of inspiration to create a better body of work and be more critical of myself now more than ever. Am I being cynical? Maybe. 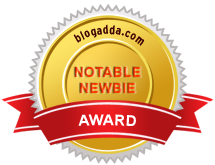 But I am also a reader who genuinely enjoys great written pieces and interesting styles documented by blogs. 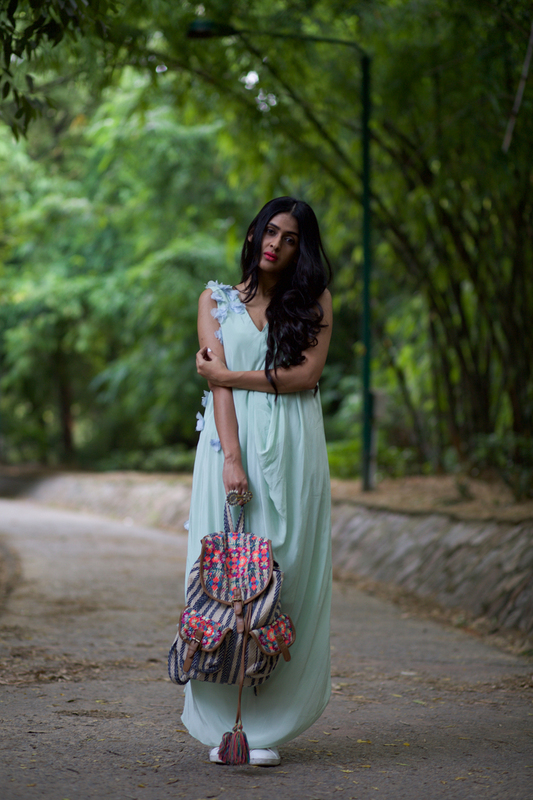 I take actual pride in the work that some of my favourite fashion blogs in the Indian circuit do and I make that amply clear. But I believe that for every ten people who aspire to be or are fashion bloggers, at least five should enrich your (and my) life by cool/smart/fun value additions. 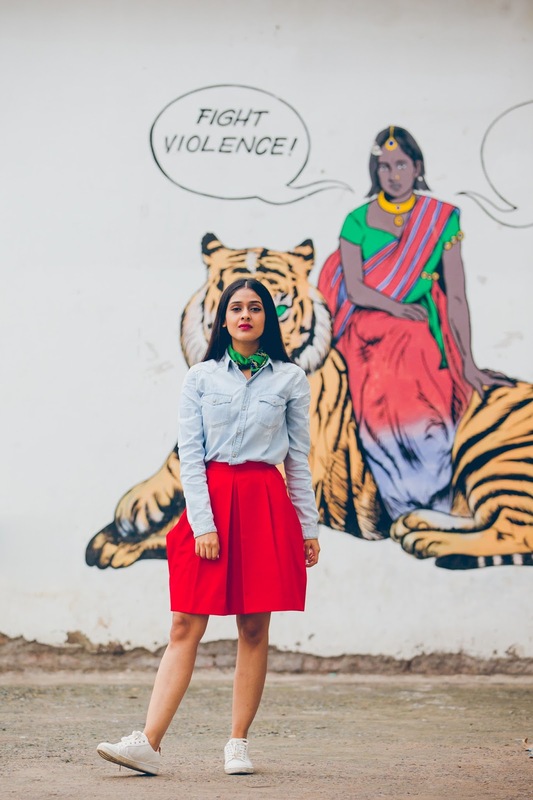 Is it time to realign our paradigms of what we classify as fashion blogging in India? In my opinion, yes. Let us inspire, empower and hatch plans to take over the world. I would be happy to entertain a healthy debate here including take criticism about my own work because God knows I have put out some not so funny and not so inspiring posts at some time or the other. P.S. 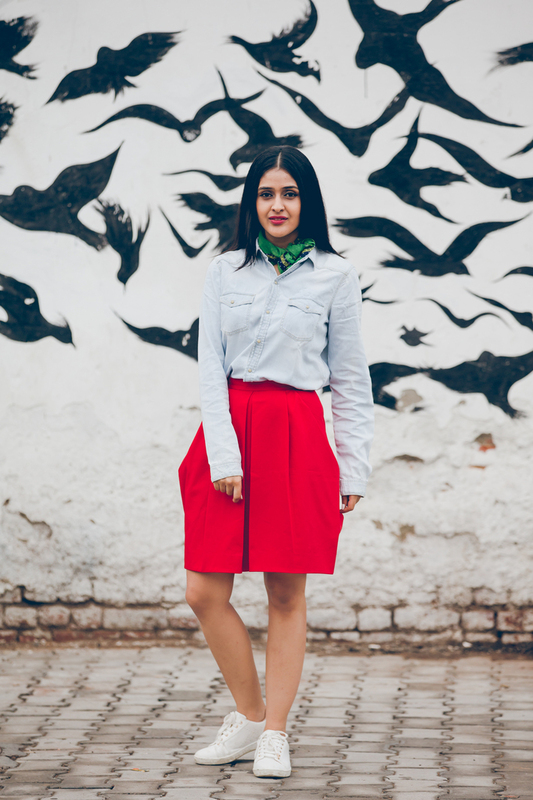 : I would have never had the gall to neckerchief my way into this outfit if it wasn't for Man Repeller and since this was the only one I had, I couldn't have been happier for the colour play.